TCAV – Ron Carter wins inaugural Ian Occleshaw Award. Ron Carter wins inaugural Ian Occleshaw Award. Frannkston TC stalwart Ron Carter is the inaugural recipient of the prestigious “Ian Occleshaw Award”. TCAV Board of Management struck this award to honour our former President, Legend and Life Member. it is not an annual award but a an award to recognise an exemplary achievement or action of one of our members. Such an achievement or action will have been conducted in the true spirit of “Mr. Occ” who demonstrated humility, grace, integrity, and commitment throughout a stellar career. At 98 years young, the oldest living TCAV member, and still offering advice to the Frankston TC we think Ron is the perfect recipient of this very special award. Members may be interested to know that Ian has moved into permanent care recently. His beautiful wife Marie continues her wonderful support. 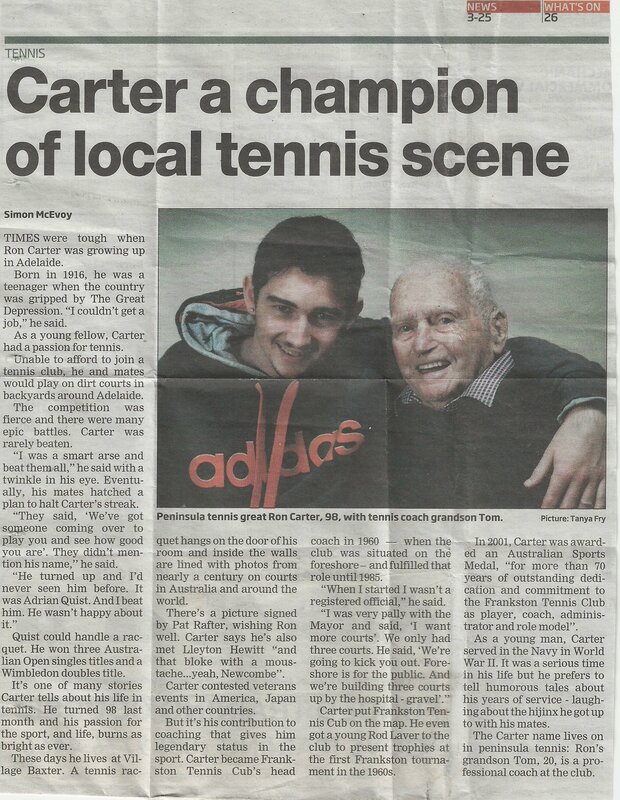 Attached are links to Ian’s biography and an article about Ron and his contribution to the Frankston Tennis Club.